We're asking for personal stories of the economic struggles families face today - stories that will become part of our efforts to reverse the policies that have done so much damage. The United States is hurting. Large banks and other Wall Street firms raided our economy, leaving millions of Americans to suffer. Around the world, poverty, hunger and HIV/AIDS threaten global health. 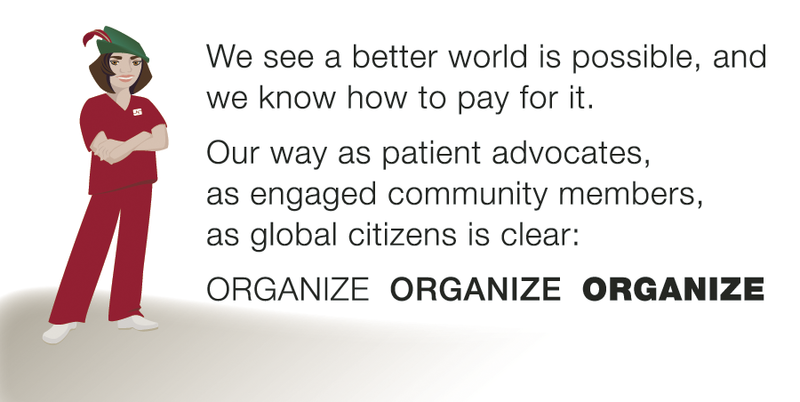 RNs' duty as patient advocates compels a response: the Nurses Campaign to Heal America. Start by sending a letter to your Congress members now. It’s a simple idea: add a tiny sales tax on Wall Street trades that will generate $350 billion a year. The tax - 50 cents on every $100 of trades - can help fund social services and rebuild our communities. Taxpayers bailed out Wall Street. It’s time they paid us back. Working class people are suffering in this economic crisis while the rich grow wealthier and politicians do nothing. The Robin Hood tax can help jump-start a new Economy for the 99% that improves jobs, healthcare, education, retirement and the environment. No matter how the U.S. Supreme Court rules, our health care system will remain broken. We fight for an improved Medicare-for-All system where everyone — rich or poor, young or old — has access to the same standard of safe medical care. Patients’ needs must trump insurance coverage.